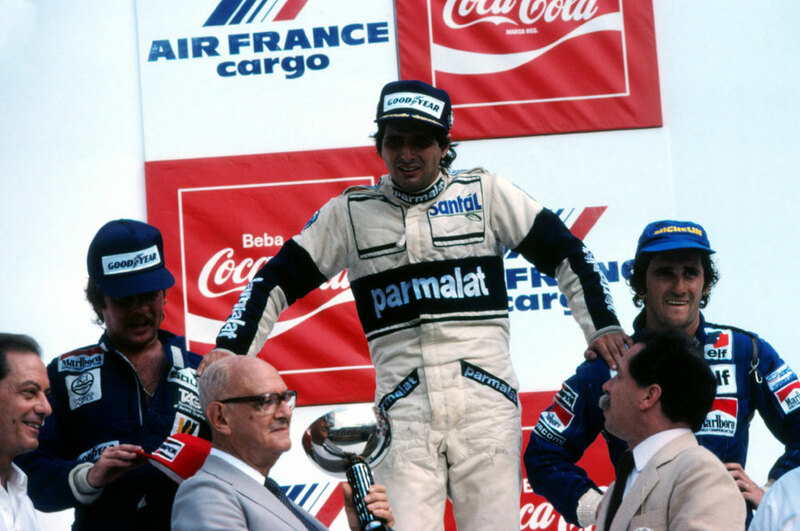 Nelson Piquet's victory in front of his home crowd caused wild celebrations in Rio de Janeiro but he was not in a position to make the most of them after collapsing on the podium, a victim of heat and exhaustion. A post-race appeal from Ferrari over the weight of Piquet's Brabham - and the Williams of Keke Rosberg which had finished second - was upheld by the FISA Court of Appeal and so they were disqualified and Alain Prost was awarded the win from John Watson (McLaren) and Nigel Mansell (Lotus). Prost and Gilles Villeneuve occupied the front row, and Villeneuve made an almost customary flying start and raced into an early lead with Rene Arnoux in close pursuit. Piquet's Brabham was back in seventh, but he gradually climbed through the field and by one-third distance he was sandwiched between Villeneuve and Keke Rosberg. On the 30th lap Piquet tried to overtake Villeneuve on the straight; the Ferrari stayed in front but lost control on the next bend and spun off. That left Piquet in the lead but Rosberg was pressurising him before he eased off, reckoning that the last laps would be a test of physique more than mechanics. Prost was alone in third, and that's how it finished. An exhausted Piquet had to be lifted from his car at the finish - his team-mate Riccardo Patrese also had to be helped out of his cockpit although he did not manage to go the full distance. The race also marked the end for Carlos Reutemann. He had quit after failing to land the world title in Las Vegas the previous October, but had been persuaded back by Williams when Alan Jones himself retired. But Reutemann was outdriven by Rosberg in Rio and finished in the catch-fencing. That convinced him it was time to walk away for good.